"In an attempt to eat healthier, my husband and I have been eating more vegetables and less meats. As a result, I have become more creative coming up with dinner meals. This casserole was delicious, used fresh vegetables I had on hand, and went together very quickly. I topped the casserole with French fried onions. Another option would be more grated cheese or crushed potato chips." Combine green beans, squash, peas, and carrots in a microwave-safe glass or ceramic bowl; cook until tender, 3 to 10 minutes. Rinse vegetables with cold water and drain. Heat olive oil in a skillet over medium-high heat; saute mushrooms in hot oil until tender, 5 to 7 minutes. 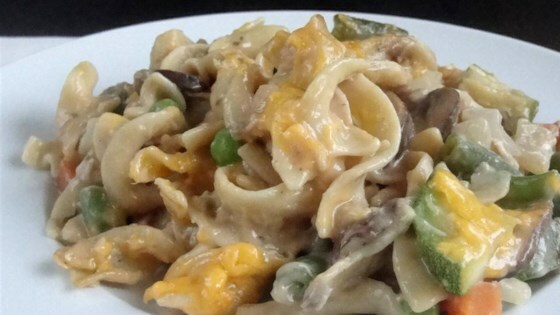 Whisk mushroom soup and milk together in a large bowl; add vegetables, mushrooms, tuna, onion, and Cheddar cheese. Mix in Worcestershire sauce, salt, and black pepper. Pour mixture into a casserole dish and top with French fried onions. Bake in the preheated oven until bubbling, about 20 minutes. I would leave out the fresh mushrooms, they added an odd texture, also definitely more tuna than called for. But it was a recipe really good for a base and to tinker with. Will make again. Very bland and needed more tuna for sure. I don't think it is even worth trying to modify to make it again. Really liked this. However, I did change a few things.